The following post is written by the designer of the Crowfoot and Macleod Canadian stamps, Wanda Lewicka. 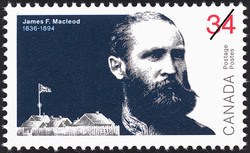 Originally, both Crowfoot and James Macleod were going to be commemorated on a single stamp. I had questioned the problem of who should go in the front or on top, which lead to the decision to issue it as a series of two stamps. These stamps were issued to commemorate the 100th year anniversary of the Peace Treaty. To depict this in the design, there is a darkness between Crowfoot and James Macleod when they are looking away from each other, but when they face each other, the background separating them is white with the word "Canada" placed between them. I originally wanted the dark blue sky to come across the two stamps, but there was the concern of the magnetic bands on the side. Therefore, the stamps had to have a white frame around them. The faces are a series of three retouched photo layers of overlapping colors: navy, dark blue and a lighter blue grey that were retouched by hand. 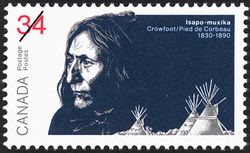 If you look carefully at the Crowfoot stamp, you will notice a knob of hair that sticks out over onto the white top band of the stamp. It is a key part of the design, and I wanted it to cross into the white frame, which was allowed as it did not impinge on the magnetic bands on the side. It is the skull of an "OWL" (not a crow interestingly enough) wrapped in Crowfoot's hair, and it was important to him. Also, when I drew the teepees, I left one of them without graphics. It is Crowfoots teepee. As a wise chief, he did not want any symbols on it. Reading his history was very difficult for many reasons. It was especially hard to read his descripion of the grief he had for the loss of many family members and his children to tuberculosis and famine and of the move onto the reservations. The Macleod stamp has a British flag on the flag pole. The year of the stamp publication is also hidden on both stamps.